Free, Family Friendly, Community Event! 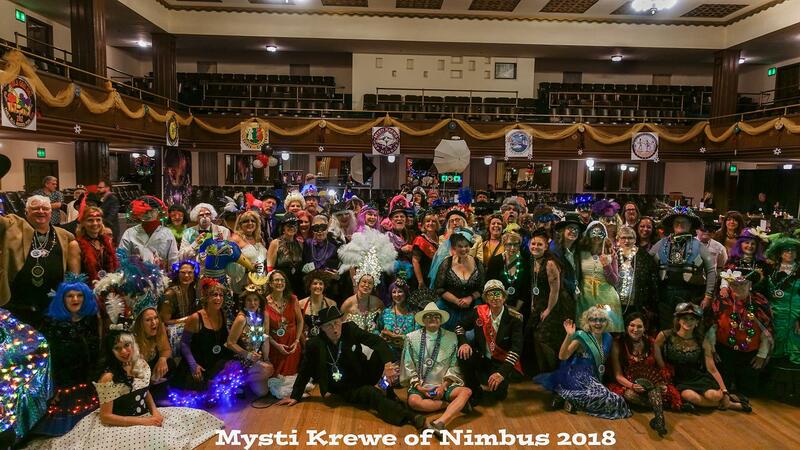 Join the Mysti Krewe of Nimbus for the Mardi Gras Parade! 6:00 Costume contest begins – aim to end by 6:45 or so. 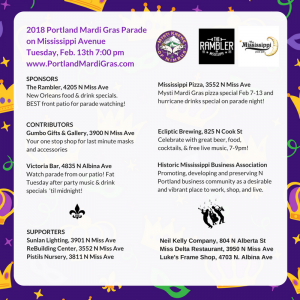 The Costume Contest is judged by the current Mardi Gras King and Queen who will be crowned at the Mardi Gras Ball on February 10th, the Saturday before Mardi Gras. 2017’s Royalty were King Phil Garfinkel and Queen Margo Phillips. We also hand decorate 100 mini-umbrellas to give away as Parade throws / souvenirs. And we’ll have plenty of beads for all for you to keep! 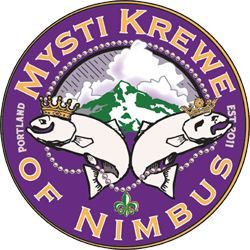 We ask that participants line up behind the Parade Lead, Royalty, Krewe and Flambeau in the Second Line section. All beads and mini-umbrellas in our wagons are for Krewe only to distribute to the crowd. Thanks for your enthusiasm! and thanks to Victoria and Luke’s Frame Shop-Albina, and everyone on Mississippi Ave for your support! Next PostNext Why are Purple, Green and Gold so important?